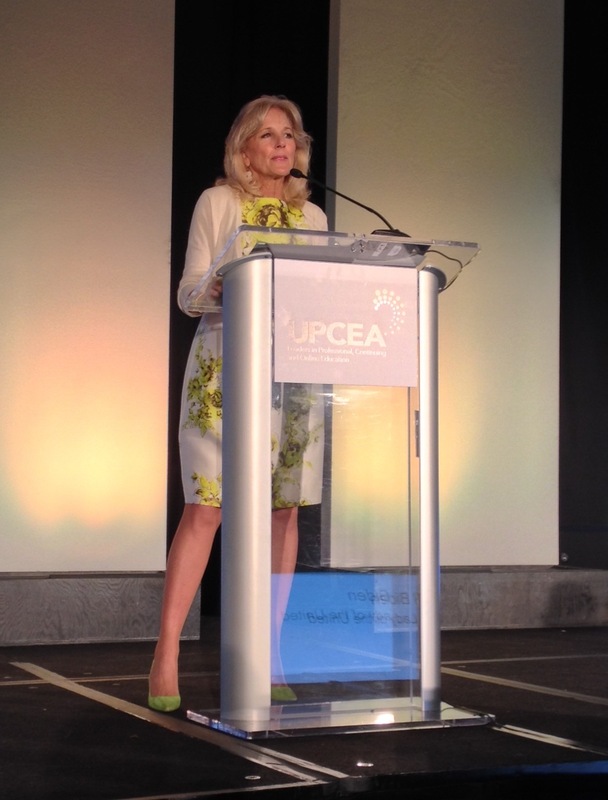 I’ve been involved in international education for a long time, having lived and worked in both the U.S. and overseas. I love what I do. I get to travel the world, meet wonderful students, supportive parents, and dedicated colleagues who are also interested in international education. In all of my years of travel, however, I had never been to Vietnam until this year. What an eye-opening experience! As an American, my exposure to Vietnam was either through American history classes and the media or the few Vietnamese students I had met in my ESL classroom. These perspectives were limited and, in some cases, flawed. Media is less than favorable, history lessons are incomplete, and the students were incredible. I wasn’t sure how to approach my first experience in Vietnam so I did what any traveler does: I dispensed with my preconceived notions and was ready for any experiences that lay before me. They were all tremendous. Taping a show about SIU. 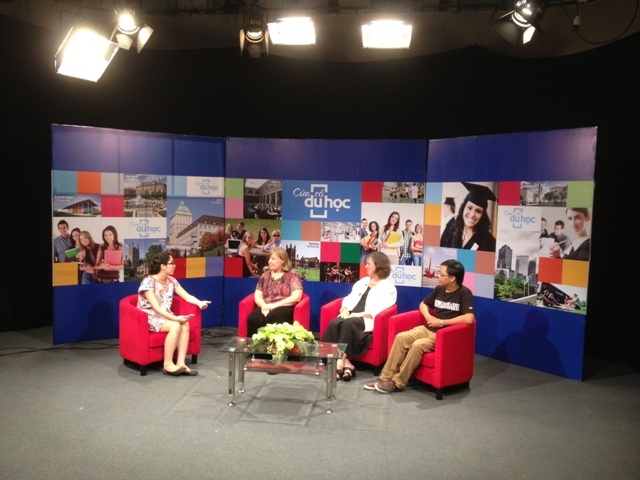 From left to right: Ha Quyen, host; Cheryl Ernst; Kimberly Leonard, Dean, SIU College of Liberal Arts; and Nam, SIU alumnus. Before traveling, I contacted the few Vietnamese students I know on campus. We interviewed two of them for our Vietnamese brochure and they put me in contact with alumni. Without the help of these two ladies my trip would not have been as rewarding as it was. Typically, when I contact a student and ask for help, I am given a few names or hear some expressions of interest. Little did I know that in working with our students and alumni, I would be introduced to some of the most incredible folks I have ever worked with. The alums were eager to help in many different ways. They attended presentations and helped man the booth at the VietAbroader fairs in Ho Chi Minh City and Hanoi. 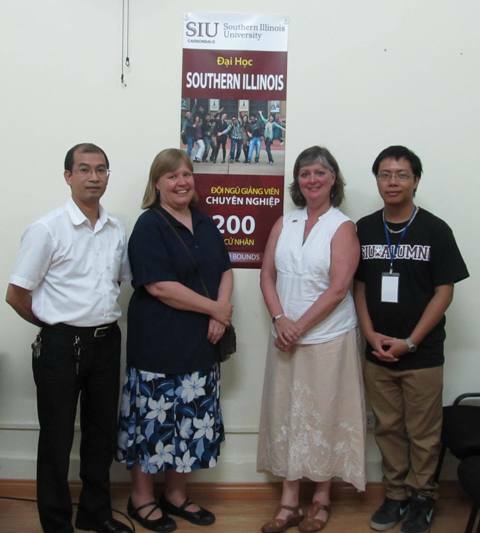 One even participated in the taping of a TV show about Southern Illinois University (SIU). The Vietnamese students I met were motivated, articulate, and enthusiastic. They asked focused and well-informed questions about our programs and a variety of fields. While all students ask about finances (it’s an important topic! ), the students at our fairs and info sessions asked many other questions. They wanted to know about the student associations on campus, available resources, and housing options, for example. The students I have had in my program as teaching assistants and in my classroom as students have been motivated, intelligent, confident, and eager. 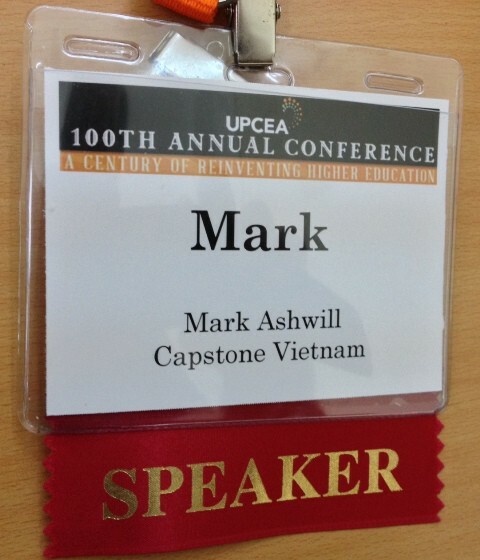 Because Vietnamese students are not the primary demographic in my program or classes, they could easily be overlooked. However, this is not the case. They are willing to speak up and contribute thoughtful and insightful comments. They are prepared, often better than others in the class. After an info session in Capstone Vietnam’s Hanoi office. From left to right: Dũng (alumnus), Cheryl, Kimberly and Nam (alumnus). The Vietnamese students we have had are of such a high quality that I was able to place two of them into my language program. It is unusual to have non-native speakers teaching other non-native-speakers. Both of these students were excited at the opportunity to teach in our Center for English as a Second Language (CESL). Initially, I had concerns but none of our international students complained about accent, teaching methodology, or personality. The ladies received above average evaluations and were true contributors to our CESL team. Because of my experiences with these dynamic students, I am actively seeking Vietnamese students to come to my language program (i.e., CESL) and our highly regarded university, Southern Illinois University Carbondale (SIU). Thanks to a grant from the U.S. Department of State’s Fund for the Improvement of Postsecondary Education (FIPSE), five U.S. universities will have the opportunity to incorporate Vietnam into their internationalization strategies and develop partnerships with counterparts in Vietnam in the coming academic year – with the assistance of the Institute of International Education (IIE). The International Academic Partnership Program (IAPP) grant includes a November 2013 visit for high-level delegations from each of the five institutions to three cities in Vietnam – presumably Hanoi, Danang and Ho Chi Minh City – to meet with potential partners, U.S. Mission officials, representatives from the Vietnamese Ministry of Higher Education (read Ministry of Education and Training), and other education-related organizations, according to IIE’s press release.